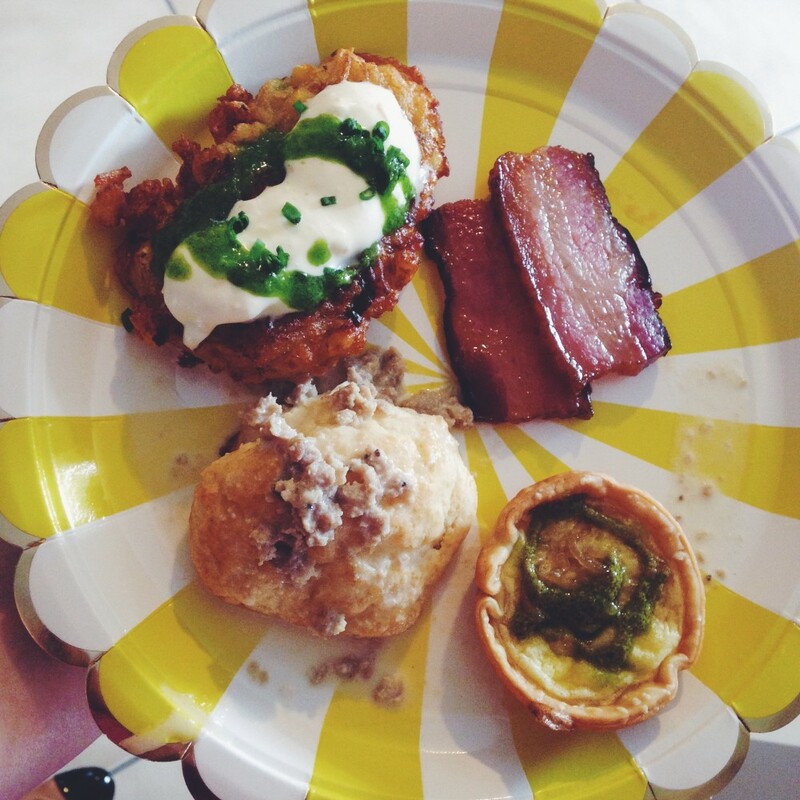 I left one little detail out of recap yesterday of Alison’s baby shower — the food! And for an important reason: this topic deserves its own post. For the shower I tried out Kitchensurfing for the first time, which is an awesome service where you book a private chef to prepare a meal customized to your event, cooked right in your own home. Now, I was excited to try out Kitchensurfing because I mean, the bulk of the work that comes with throwing a party revolves around prepping, cooking, and serving food, and having someone else take care of all the handwork really frees up time for things like … taking the curlers out of your hair more than 8 seconds before you guests arrive while pulling appetizers out of the oven. So, Kitchensurfing matched me up with a great chef named Tim, who worked with me to customize a gourmet brunch men full of bite-sized treats including: mini biscuits and maple sausage bacon, crispy potato cakes with roasted corn, individual caramelized onion and goat cheese quiches, and candied bacon – YUM! 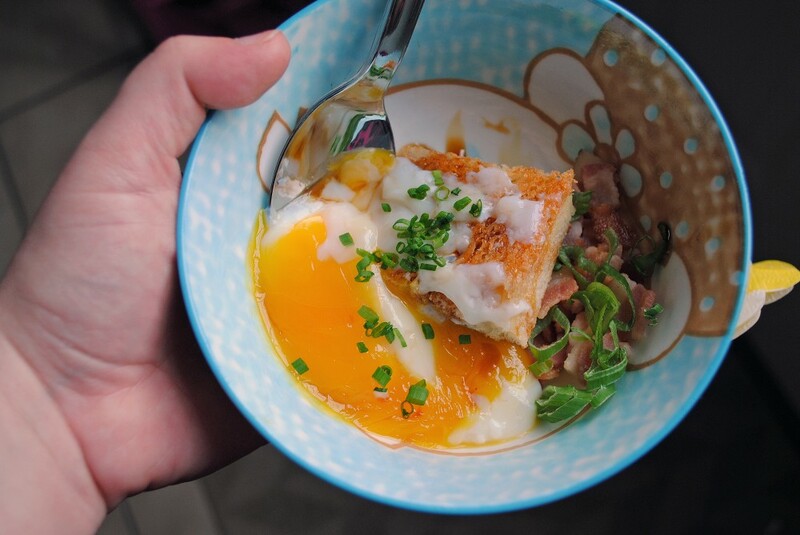 And for a real show stopper – Tim made individual bowls filled with crispy bacon and onions, butter brioche toasts, and a cracked to order sous-vide egg on top. I was a little nervous before the event that I’d be anxious about giving up control of my kitchen, but the truth is that Tim such a great job that I was really able to enjoy the party instead of being stuck in the kitchen, and what’s better than that? Want to try Kitchensurfing? Sign up here and receive $50 off your booking! 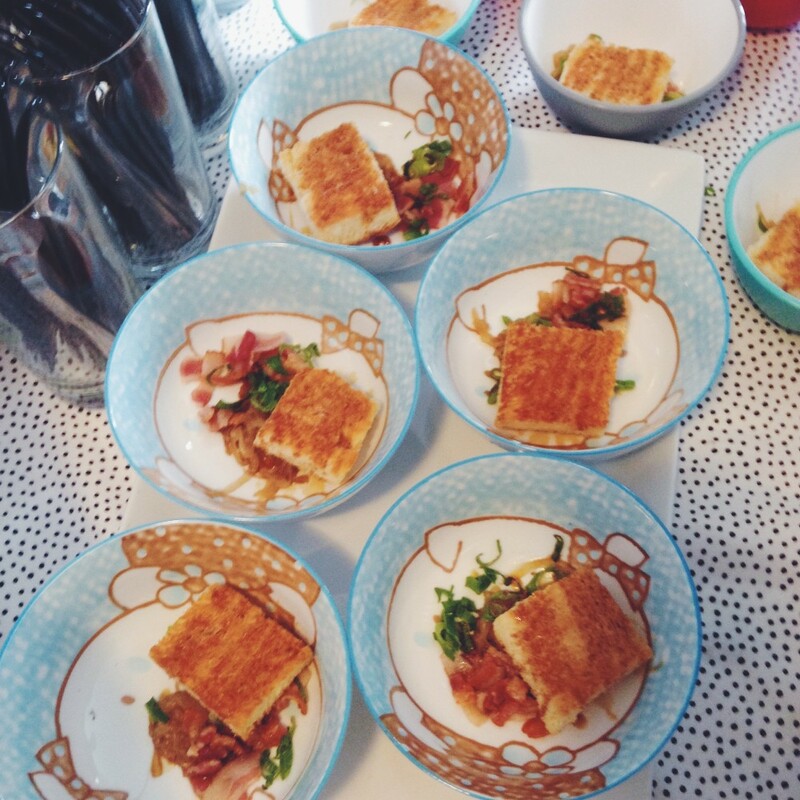 Please note: Kitchensurfing provided their serves free of charge, all opinions are my own. A Blogger Bestie Baby Shower. Bloody Mary Favors. I can attest to the deliciousness. I’m going to dream about the sous vide, bacon and potato pancakes FOREVER. Hiya! Quick question that’s completelly ooff topic. fihd a theme or plugin that might be able too correct this problem. If you have any recommendations, please share. Thamk you! Having reead this I believed it was extremely enlightening. to put this information together. I oncce again find myself spending a lot of tine both reading and commenting. Quality articles or reviews is the main too intferest the visitors to pay a visit the website, that’s what this web site is providing.